I'm closing out the week with a casual look. Whenever I'm at a lost on what to wear my fall back is always a graphic tee and a blazer, the rest just kind of falls into place. 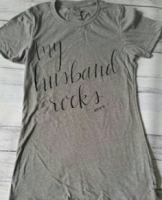 I got this tee from Union28 Apparel a few months ago and I did a post on why "my husband rocks". (Check it out here) I wanted to actually style it this time for an OOTD for the blog. I paired it with a boyfriend blazer and white denim. These white denim have been like second skin for me lately lol I can't stop wearing them! I opted for flats instead of heels to give it a more comfy chic vibe. These rose gold loafers are just the cutest and best of all found them on sale. They are sold out on Forever21's site but I linked a similar pair below for you guys. Oh and hey Brotis wanted to make an appearance on this shoot! (Not really) He was chasing birds at the park and happened to run into my shot, hence why his face looks so focused. Haha! Love my little fur baby.